A non-compete agreement is a document in which an employee agrees not to compete against a former employer or other company and/or agrees not to solicit clients of the employer usually within a certain geographic area and usually for a certain period of time after termination or separation of the employment relationship. 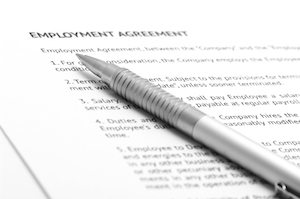 These agreements are meant to protect the proprietary and confidential business interests of the employer. KALIS, KLEIMAN & WOLFE’s attorneys advise executives and managers of their obligations under Florida employment law if they wish to overcome a Florida non-compete contract. We counsel employers and let them know that they must abide by the specific requirements of the contract in order to enforce it. To be enforceable, the employer must demonstrate that the need for the agreement is supported by legitimate business interests of the employer.Non-compete agreement obligations that employers must fulfill can include things like paying all salary and benefits at the level specified, and paying severance or giving notice if required by the contract. If the requirements are not fulfilled, the employer may not be able to enforce the contract. In order for a non-compete agreement to be enforceable it must be necessary to protect the parties’ legitimate interests, it must cause no undue hardship on the former employee, and it must not impair the public interest. The experienced lawyers of KALIS. KLEIMAN & WOLFE, P.A., are well versed in employment contacts, business law, and we understand what is at stake in these business disputes. For more than 20 years, our attorneys have advised and represented clients in regards to the analysis, drafting, review, negotiation, and litigation of matters related to non-compete agreements. In addition to non-compete agreements, our business attorneys can also assist employers with confidentiality clauses, non-solicitation clauses, and confidential information or trade secrets. Our goal is to protect our client’s interests, making sure they understand the laws and their obligations and rights under those laws. If you need assistance establishing, overcoming, defeating, or defending against Florida non-compete agreements and need guidance on Florida non-complete contracts, contact the experienced Corporate Law Attorneys at KALIS, KLEIMAN & WOLFE, the South Florida-based commercial litigation law firm today at (954) 791-0477. Click here to see our Notable Cases.